Linked to the construct tab is this GNT-T tab. As you can see the results are easy to spot, and they were returned quite quickly. 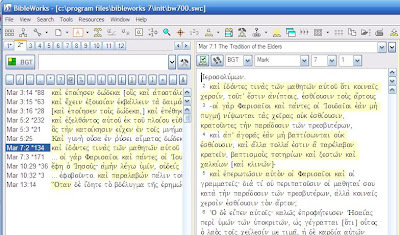 That was an interesting challenge, and I was trying to figure out how to run such a search in BibleWorks7 with which I am more familiar. I came up with two ways, and they are interesting for figuring out the capabilities of the Graphical Search Engine. 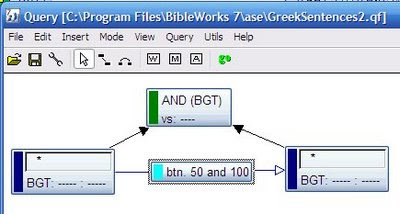 1) In the first search, the trick was to enable the cross verse boundary search (found in the GSE under Query > Properties > Flags tab > check "Cross verse boundaries"). In the ordering mode box, I required custom punctuation of a Greek period or question mark. Here is the QF file if you want to download it and run it for yourself. 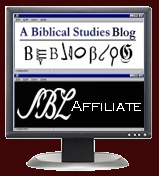 (Save it to the ASE subdirectory, and be sure to set a range to a single Bible book before you run it.) And here is what the results look like for the Gospel of Mark. 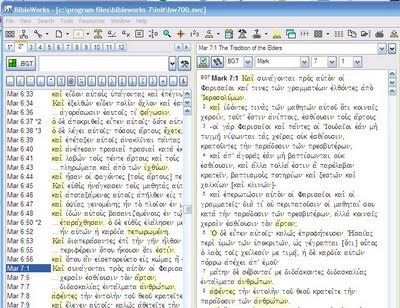 You can see that you have to scan through the whole gospel and look for instances where the highlighted words, which mark first and last words of sentences, are furthest apart. 2) In the second search, I took the opposite approach. I again used the cross verse boundary search, but I somewhat arbitrarily asked for between 50 and 100 words where there was not a period or question mark. Hence in the ordering mode box I excluded those markers. Here is the QF file to try it for yourself. The results look like this. You need to ignore the highlighting because of the word range search I did, but you can see that the search results are exactly the passages that Decker found and commented upon. 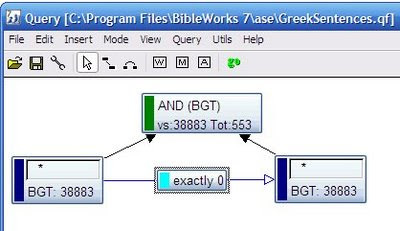 I suspect there is another way to do this in BibleWorks using Range Filters (in the word boxes), but I couldn't get that to work. If you find a better way, please share it here or on the BW forum. I'm still learning the intricacies of Logos3, but I'm guessing there must be a way to do such a search using syntax search. If someone figures that one out, please share it here! 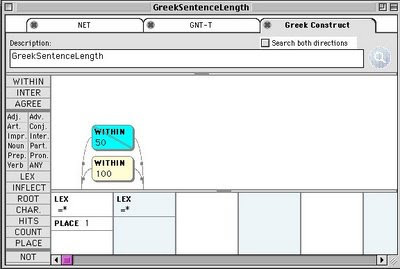 It might be possible in the Lexham Syntactic Analysis (which doesn't yet have Mark), but I don't think its possible with the way Opentext is set up. I do think it could be done with a graphical query though, since Logos also allows crossing verse boundaries. Yes, it can be done with a graphical query. The basic idea of the search I put together was to find within a sentence a word (wildcard) within 50 to 99 words of a word (wildcard). The list I got approximates the others. I have not found an OpenText solution. Although it seems like it should be something that a syntactically tagged text should be able to handle.